For one reason or another, I always get really into old timey music around this time of year. Last year, I made a playlist of (mostly) ’30s, ’40s and ’50s music after watching Hannah and Her Sisters during Hurricane Sandy. I started out with music from that film and others by Woody Allen and kind of went from there. It became my go-to mix for the holiday season. (You can listen to it here.) I played it while cooking two different Thanksgiving dinners and…I still listen to it sometimes while I’m cooking. Anyway, this year I’ve been all about novelty songs. I think this all started with my brief Annette Funicello obsession last month. The Mouseketeer and “Beach Party” queen had quite a few (good/really catchy) novelty hits. I’m still never really sure if a song qualifies as a “novelty”, but if it’s goofy, nonsensical or (eep!) kinda culturally insensitive, it goes on my list. (I’m focusing on pre-1965 songs, so I’m sorry to say that there won’t be any Weird Al on the list. ) I’ll probably debut this mix at a party next month, but in the meantime, I thought I’d share some of the more notable/weirder things I’ve been listening to. This is another song I remember hearing – and getting stuck in my head all the time – when I was very young. There was a collection of Shirley Temple films released sometime in the 1990s that was constantly advertised on television. It featured clips from many of the films, including a clip from Curly Top of the scene where she sings this song. I mentioned before that I got super into Annette Funicello last month. 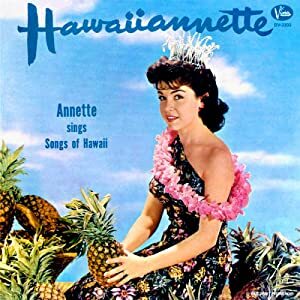 This song, on her cleverly titled Hawaiannette album, was a hit for her. The lyrics are almost offensive in their depiction of “Hawaii” – Hawaii = bananas, surfing, coconuts, nonsense words, alligators, bamboo, a lot of other weird things – but I still love this song so, so much. This song is just silly. Below you will find the song playing over a really strange short film from the 1940s made for Chiquita.